At your first prenatal visit, your doctor will do several blood test including a test check your blood type, whether it's type O, A, B, or AB, and your Rh status, whether it's Rh-negative or Rh-positive. There are 4 blood types, O, A, B, and AB, and each blood type can be Rh-positive or Rh-negative. Early in pregnancy a mother's blood will be tested to determine the blood type Rh status - that is, whether she has the Rh (Rhesus) factor, in which case she is Rh-positive. 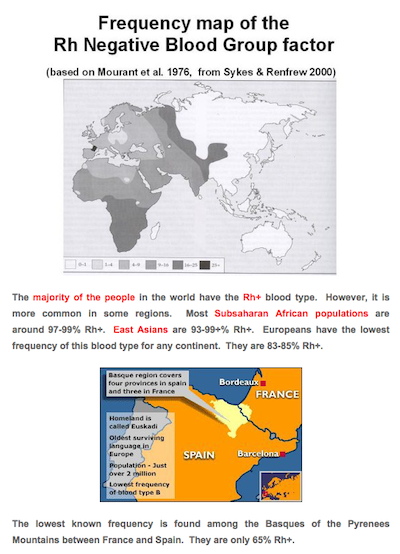 (About 85 percent of Caucasians are Rh-positive, as are 90 to 95 percent of African Americans and 98 to 99 percent of Asian Americans). If you don't have it, you're Rh-negative, and you'll need to take certain precautions during your pregnancy. If a pregnant woman is Rh-negative, then there is a chance she might get sensitized during pregnancy or delivery, which could be a problem in the next pregnancy. Women who are Rh-sensitized can create antibodies which could conceivably cross the placenta and attack the fetus' red cells. To prevent Rh-sensitization, pregnant Rh-negative women get a shot of Rh iimmunoglobulin at least once during the pregnancy, as well as after delivery if the baby turns out to be Rh-positive. This shot will protect the mother from developing antibodies that could be dangerous during this pregnancy or in future pregnancies. If the baby's father is also Rh-negative, then the baby will be Rh-negative too, and no shot is needed. If you're Rh-negative and you've been pregnant before but didn't get this shot, another routine prenatal blood test will tell you whether you already have the antibodies that attack Rh-positive blood. If there are antibodies, then it's too late to get the shot, and if the baby is Rh-positive, he's likely to have some problems. If you don't have the antibodies, then the shot will protect you from developing them.